While at the Montréal e-Prix we explored the e-Village, an area of the venue that was dedicated to technology innovation, and especially that which revolves around automotive design. During our exploration, we happened on five university engineering teams that compete in the Formula SAE, a competition for fully electric vehicles. Over the next few days, we will bring you all of their stories, we will begin with the team from Concordia University in Montr�al. 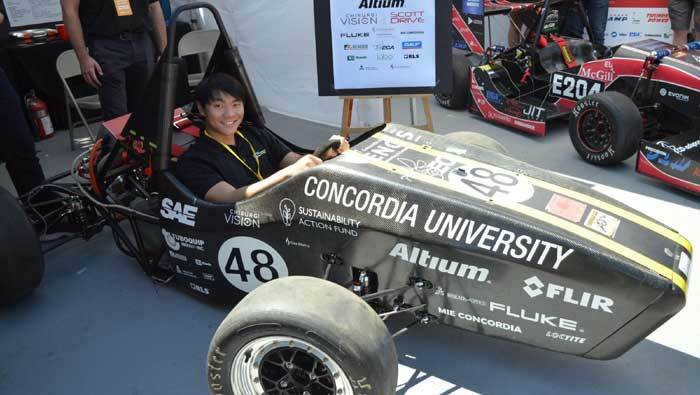 We spoke with Huy, a Mechanical Engineering student at Concordia and a member of the University's Formula Electric team. Because of his educational background he "[works] mostly on the drivetrain systems." The team is part of the Concordia Society of Automotive Engineers (SAE), and "this is the first year that [the University] has a Formula Electric team," Huy said. The students design and build their own cars for competition. The team is made up of student "from all the engineering departments." The team is not exclusive to engineers, all students are welcome. For their inaugural design, the team "took an old chassis of a combustion car and converted it into an electric car for the competition." The car uses "lithium ion battery cells by LG Chem." Huy explained that "they are the same type of batteries you would find in your laptops or cell phones, it has the same chemical components inside." He added that the "test results have been pretty good," so the team is happy with what they have seen. The car is designed for a "top speed of 120 km/h, and our range [on a single charge] is about 25 km, a little less if you're going max discharge on the batteries." The team is awaiting further detailed numbers when testing restarts after they remount the engine. Huy said that once that is done they will do "actual testing and have more exact numbers." Money isn't everything, though it does make things happen in our society, and like any other successful endeavour, Formula Electric Concordia needs to raise money for their project. Huy explained that they "pretty much call companies for sponsorships." Not all of their funding comes from cold calling, "a lot of sponsors come from connections inside society." The team benefits largely from groups within Concordia, such as the "Sustainable Action Fund, and the Concordia Student Union." The technology that moves our society is being developed in the minds of young innovators, today. The technology that Formula Electric Concordia or any of the teams in the competition work on could change transportation. We are all stakeholders in a search for cleaner forms of energy especially in transportation, one way would be taking notice of what these students are up to. Stay with us as we bring you more stories on the Society of Automotive Engineers (SAE) Electric Vehicle Competition teams. We continue our tour of the University teams that participate in the Formula SAE Electric competition. We have looked at teams from Concordia University and école Polytéchnique. 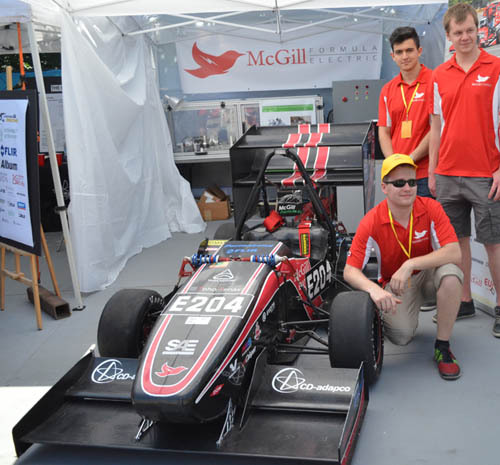 Our next stop is the McGill Formula Electric team from McGill University in Montréal. We spoke with team member Jean-Christoff Bélanger. He explained that the team is made up of students, like the others in the competition, he added that the McGill team is "mostly undergrads," though it is open graduate students. Bélanger said that "every year we build a new car, we usually design in fall, manufacture in the winter, and then we compete in the summer." McGill Formula Electric has roughly 20 members "who are 100% dedicated to this team." None of the students who compete receive credit for their participation, Bélanger said the students are involved because of "a passion for cars and renewable energy." The McGill car, if you were to pay for all the parts up front "would probably cost around $200 thousand." The team receives some funding from their University, and still need "a lot of sponsors." Without their sponsors, they would not be able to build their car, the team was given "material, machining time, [and] money." Bélanger said that McGill Formula Electric's 100% electric car uses "lithium polymer cells from Thunder Power." He explained that they have approximately "300 cells, which makes it a 300-volt battery." The motor in the car "is 100 kW, [and] it goes 0 to 100 in 2.6 seconds." The battery pack is designed to last the entire race which is 22 km. Yesterday we began our journey through the e-Village by looking into the Concordia Formula Electric Team. Today we will look at another team that competes in the Formula SAE competition, Poly e-Racing from the école Polytéchnique in Montréal. We spoke with Rémi, the former Technical Director from Poly e-racing. He explained that the team varies "between 20 to 30 students depending on the year." For each competition, they build a car that is "100% electric." Every year there are about 30 teams that compete in the Formula SAE Electric, and Rémi said that "if you include the combustion [engine] teams, there are over 500 teams." As you can see there are many teams vying for top spot. 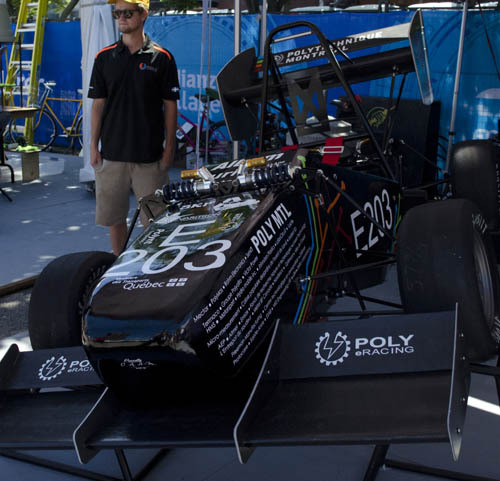 Poly e-Racing's car operates at "300 volts, [and] we have an engine that is limited by the competition to 80 kilowatts which is approximately 107 horsepower." The car itself "weighs 185 kilograms, and [is expected to do] 0 to 100 km/h in under three seconds." The race can achieve a top speed of 150 km/h. The battery setup for the car is using "560 individual 18350 cells, the same type of cell that is used in a vaporizer." Rémi added that this setup allows the "potential of 6.05 kW/h, which in competition allows us to do 22 km, which is the longest endurance run." The car is charged with 240 volts. As we saw with Formula Electric Concordia, funding is the major hurdle for Poly e-Racing. Rémi explained that "the approximate budget for one year in Formula SAE is over $100 thousand." Like the Concordia team, the group from Polytéchnique receives help from their school, though they still have to fundraise. The group participates in many events like the e-Village at the e-Prix, so they "have a lot of visibility to offer to sponsors." What is meant by this is that sponsor names and logos will be displayed on the car and or banners. Often sponsors will offer their parts for the car, and on top of getting the normal visibility, the team can "show the workmanship and quality," of the parts that are used. Rémi added that the reason they "can make cars every year is that they have a great group of sponsors." He continued by saying that they are always looking for new sponsors "because [parts and systems] need to be upgraded and we don't want to be limited by money." This team has used its ingenuity to use the same small battery that is used in vaporizers to power an e-racer. $100 thousand may seem like a lot of money but these students have the track record and know-how to get the job done. This and projects like it are worth the public's curiosity, especially if we are interested in cleaner modes of transportation. The last two University Formula SAE teams that we will look at come from the Université de Sherbrooke and école de technologie supérieure (éTS). The previous three teams have had very classic four-wheel designs. These two are a departure from what we have seen, and that is why we are looking at the two teams together. 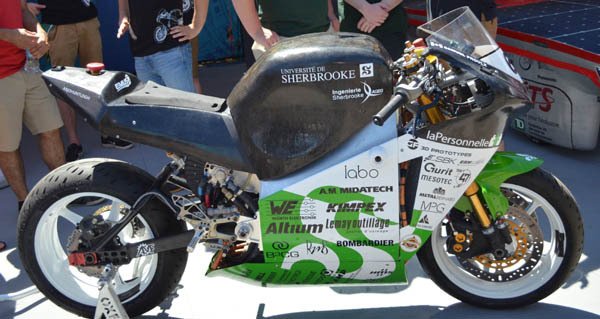 The team from Sherbrooke differentiates itself from the other teams because their design is on two wheels. That's right they designed an electric motorcycle. We spoke with the team spokesperson about the bike. The Université de Sherbrooke is in the Estrie Region of Québec. The team spokesperson said that "there are 25 people working on the bike, which are roughly one- third electrical students, one-third mechanical and the rest computer engineering." He explained that the bike project began in 2012, and "was finished in 2014." Since its completion the team has been "working on improving the reliability through testing, improving the quality of the battery, and the overall behaviour of the bike." the team spokesperson explained that the team "decided to build the bike around the batteries," and the design holds 14.5 kW/h. He added that they started "with the most important part of the vehicle and built around it." The batteries of the bike are in the chassis and sit between the thighs of the rider." Anthony Riendeau spoke for the team from ÉTS. Their design has more of a 1960s space age look to it, a large flat surface covered with solar cells and a bubble dome for covering the cockpit. Riendeau explained that they "wanted to maximize the surface of the solar panels, [that's why] the car has this odd-looking shape." 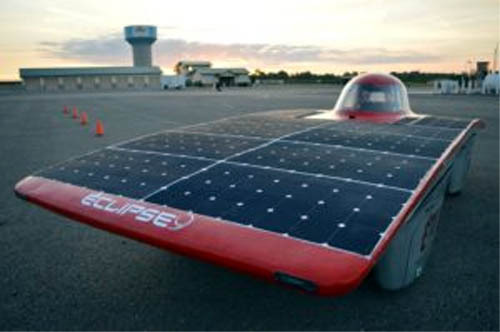 The car has "six square metres of solar panels." The remainder of the car is designed "to be streamlined, as aerodynamic as possible, and as efficient as possible." As a result, "every single part of this car is light weight, every mechanical system is efficient, there is no friction at all in the rolling systems." The team is using "20 kg of lithium ion batteries," the same as in a laptop." Riendeau said that they "assemble the batteries together and make their own battery pack out of it." All five teams are putting their, ingenuity, creativity, passion, and education to work in this competition. All five are supported, to a certain extent, by their institutions, and University Community. It's not enough to fund an entire project and that is why they are always on the lookout for new sponsors.